Use the right arrow to start browsing the presentation. 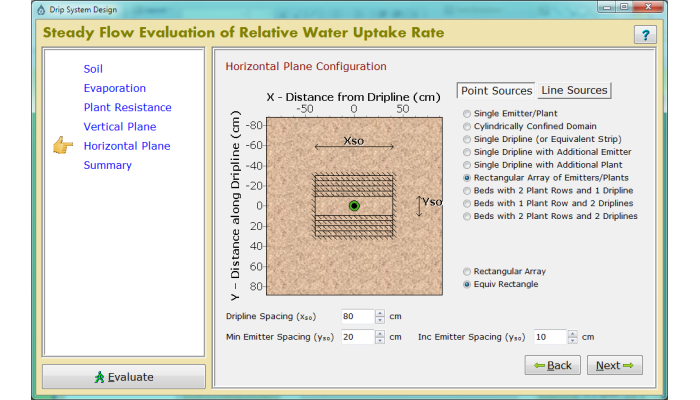 The first (steady-state) module, based on steady irrigation and water uptake processes,	is a drip system design tool for assessing the effect of geometrical attributes on water use efficiency. The soil parameters window contains a catalogue of soils and parameter edit-boxes (only α and β are used in the design module). 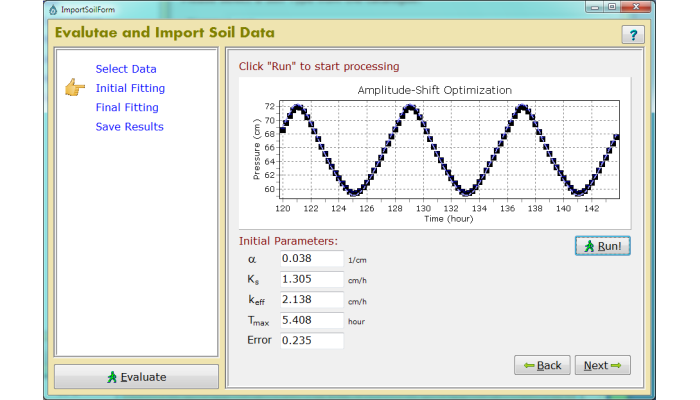 DIDAS also provides a soil parameters evaluation wizard. In the evaporation window of the design module only a constant value can be assigned to the potential evaporation factor. 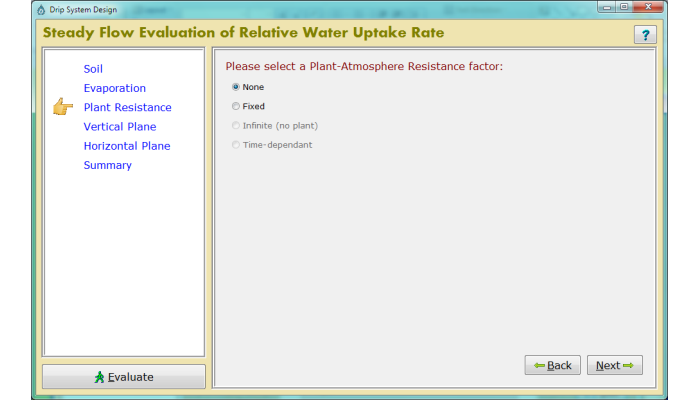 In the plant resistance window of the design module only a constant value can be assigned to the plant-atmosphere resistance factor. The vertical plane window of the design module is used for choosing among on-surface or sub-surface emitter location and for assigning values to the emitter depth and to an optional root zone depth parameter. The horizontal plane window of the design module is used for choosing among configurations of point or line water sources (and plants) and for assigning values to the relevant, constant and incremental, drip system design parameters. For several horizontal configurations it is possible to choose among two mathematically-equivalent problems of either a superposition of infinite arrays of water sources (and plants) or an horizontally-confined soil domain. The summary window describes and lists the assigned values of the parameters of the irrigation system design scenario and allows saving it for future use. 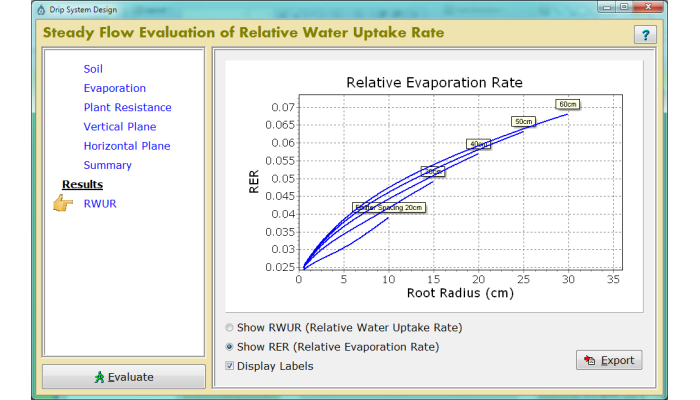 The output window of the design module displays the relative water uptake rate (RWUR, ratio between water uptake rate and irrigation rate) as a function of the size of the root zone for the incremented drip system parameters. It displays also the RER (ratio between evaporation rate and irrigation rate) as a function of the size of the root zone. The second (quasi-steady) module is also based on steady irrigation, but accounts for the diurnal patterns of plant resistance to water uptake and evaporation and describes the diurnal patterns of the RWUR and RER. 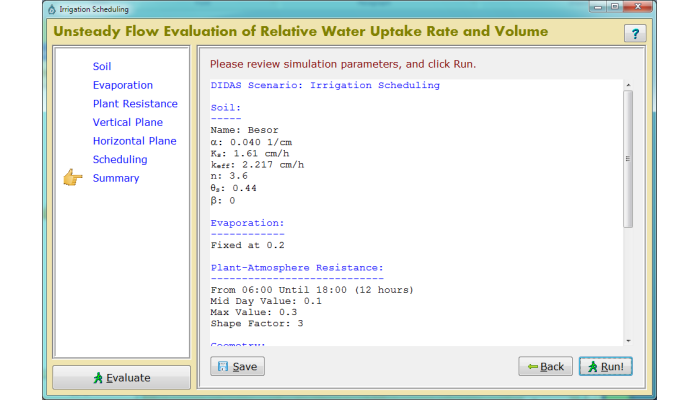 The soil parameters window is identical in all DIDAS modules. Similarly to the design module, only α and β are used for evaluating the diurnal patterns of the RWUR and RER. 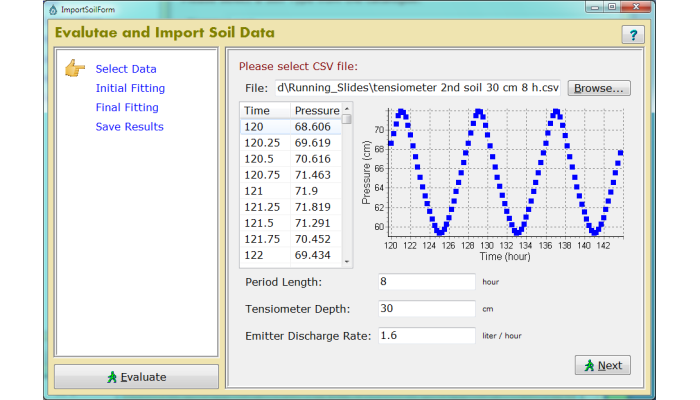 The next three slides demonstrate the soil parameters evaluation wizard. The soil parameter evaluation module determines the three soil parameters: α, Ks and keff that are used in the three main SS, QS and US modules from imported data of a cyclic, on-and-off irrigation test. In the initial fitting stage an initial, amplitude-shift inverse procedure provides a preliminary evaluation of the three soil parameters, their values displayed in the corresponding windows. In the final fitting stage - a second, Levenberg-Marquardt optimization algorithm provides the final evaluation of the three soil parameters. 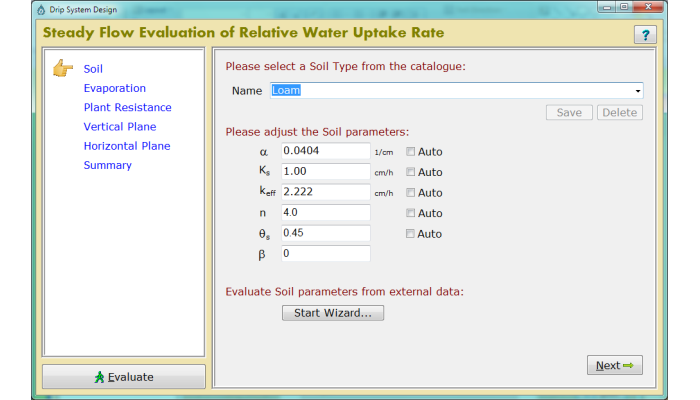 The determined soil parameters can be saved into the soil catalogue. 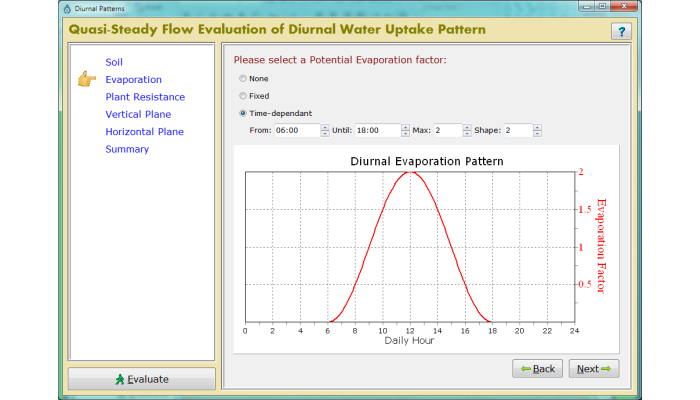 The evaporation window of the diurnal patterns module is used for assigning values to the parameters of the displayed diurnal pattern of the potential evaporation factor. 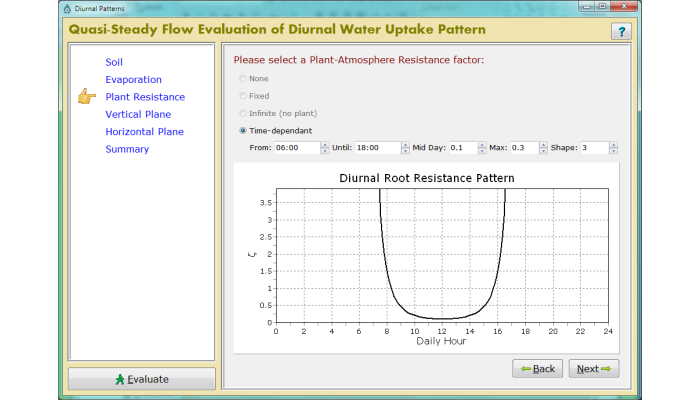 The plant resistance window of the diurnal patterns module is used for assigning values to the parameters of the displayed diurnal pattern of the plant-atmosphere resistance factor. 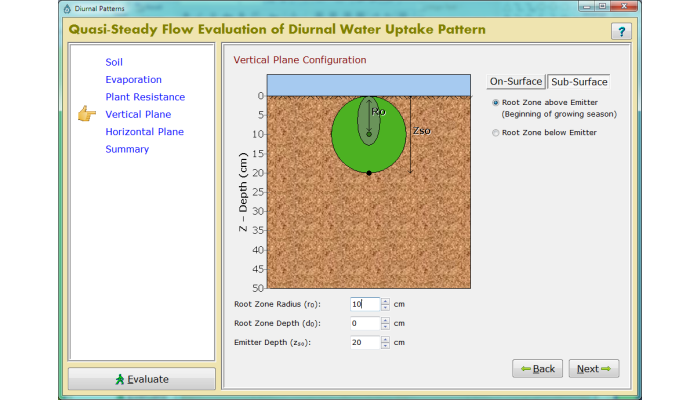 The vertical plane window of the diurnal patterns module is used for choosing among on-surface or sub-surface emitter location and for assigning values to the emitter depth and root zone parameters. 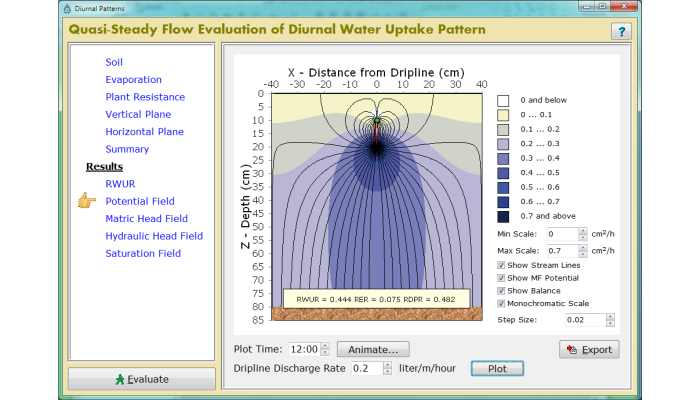 The horizontal plane window of the diurnal patterns module is used for choosing among configurations of point or line water sources (and plants) and for assigning values to the relevant, constant, drip system design parameters. 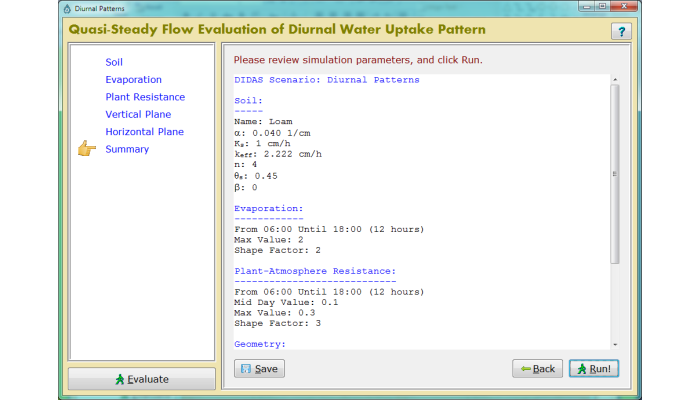 The summary window describes and lists the assigned values of the parameters of the diurnal patterns scenario and allows saving it for future use. 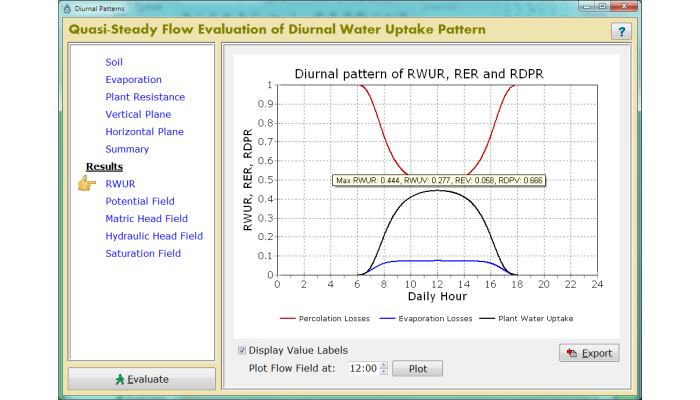 The output window of the diurnal patterns module displays the diurnal patterns of the RWUR, RER and RDPR (ratio between deep percolation rate and irrigation rate). DIDAS also provides the relative daily volumes of the components, which total to 1. 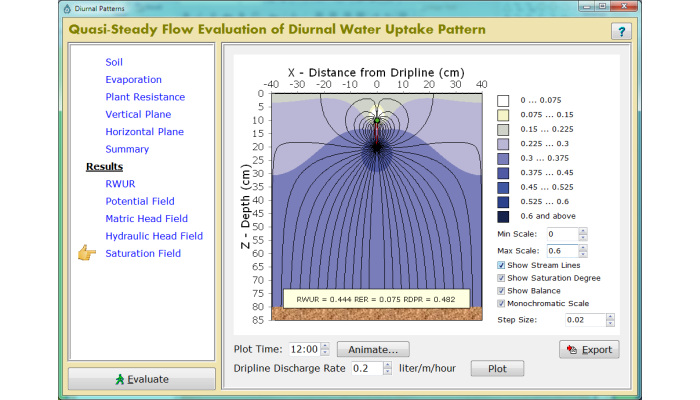 The flow field window of the diurnal patterns module depicts the vertical flow field (distribution of the water potential, here in terms of the matric flux potential, and streamlines) for the defined scenario at the assigned daily hour. Here the water potential distribution is depicted in terms of the matric head. Here the water potential distribution is depicted in terms of the total hydraulic head. Here the water potential distribution is depicted in terms of the saturation degree. The third (unsteady) module is an irrigation scheduling optimizing tool, based on the actual water application schedule and on the diurnal pattern of the plant-atmosphere resistance to water uptake. 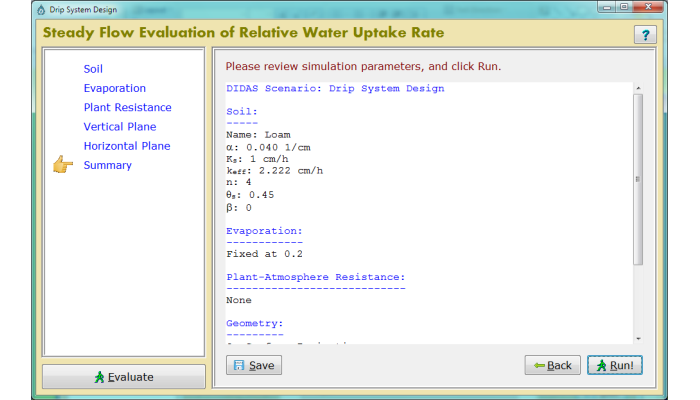 The soil parameters window is identical in all DIDAS modules. For evaluating the RWUR along the irrigation cycle only α, β and keff are used. In the evaporation window of the irrigation scheduling module only a constant value can be assigned to the potential evaporation factor. The plant resistance window of the irrigation scheduling module is used for assigning values to the parameters of the displayed diurnal pattern of the plant-atmosphere resistance factor. The vertical plane window of the irrigation scheduling module is used for choosing among on-surface or sub-surface emitter location and for assigning values to the emitter depth and root zone parameters. The horizontal plane window of the irrigation schedule module is used for choosing among configurations of point or line water sources (and plants) and for assigning values to the relevant, constant, drip system design parameters. 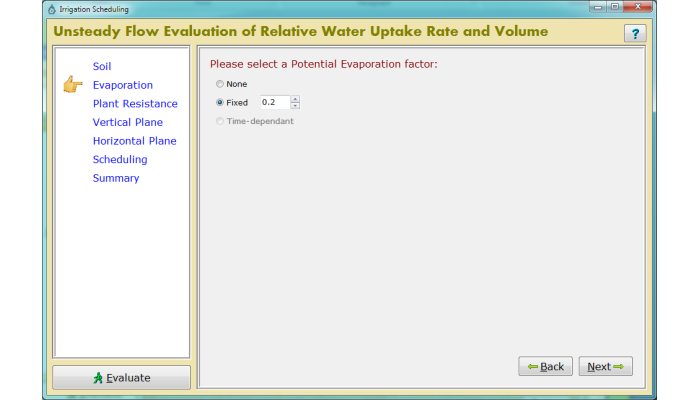 The water application window serves for defining the scheduling of the water applications. The summary window describes and lists the assigned values of parameters of the irrigation scheduling scenario and allows saving it for future use. 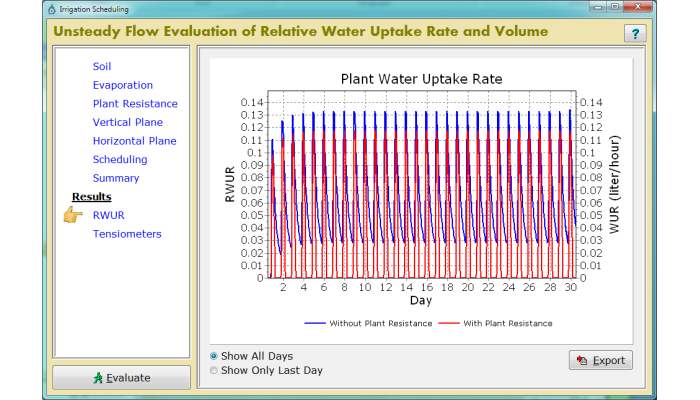 The output window of the irrigation scheduling module displays the diurnal patterns of the evaluated RWUR along the whole simulated irrigation period. The blue line depicts the RWUR with no plant resistance and the red line the RWUR accounting for the diurnal pattern of the plant resistance. Also displayed are the daily RWUV (ratio between daily water uptake volume and daily irrigation volume) and the number of daily hours for which the absolute WUR is above an assigned threshold value. 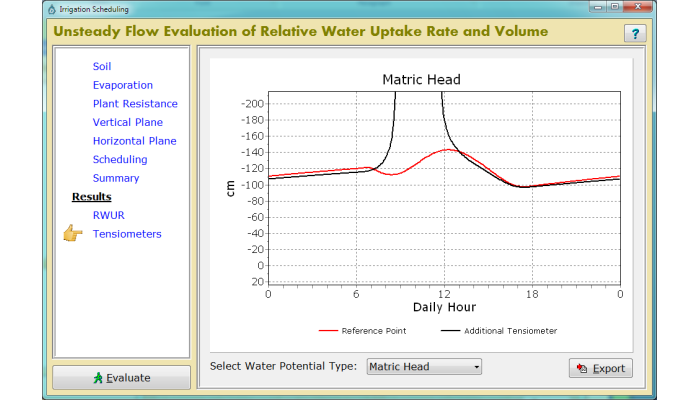 The output window of the temporal pattern of the water potential, depicts the evaluated diurnal pattern of the water potential, here in terms of the matric head, for the last simulated day (/irrigation cycle) at the locations specified in the vertical plane window. A drip-system design tool based on steady irrigation and water-uptake processes to assess the effect of geometrical attributes on water-use efficiency. 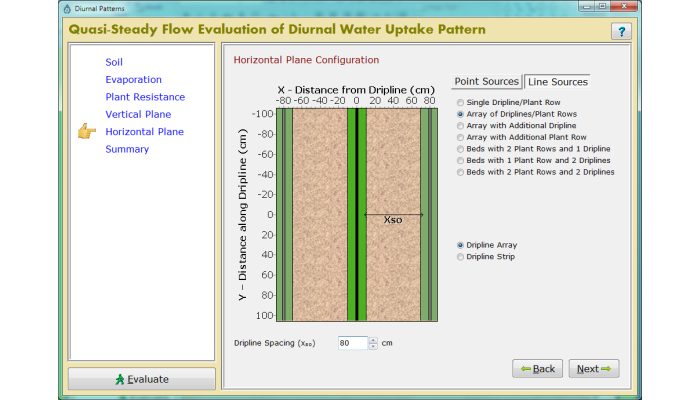 A diurnal pattern module, based on steady irrigation and accounting for the diurnal patterns of plant-atmosphere resistance to water uptake and evaporation, serving for fine-tuning of the irrigation-system design and for preliminary evaluation of scheduling scenarios. An irrigation-scheduling optimization tool, based on the actual water application schedule and on the diurnal pattern of the plant-atmosphere resistance to water uptake. DIDAS is intended for both practitioners and scholars. Potential users include private growers and irrigators working for irrigation companies, extension services and growers' associations. It is also of benefit to researchers, lecturers and students interested in the processes of two and three-dimensional water flow and uptake in soils. What is DIDAS good for? 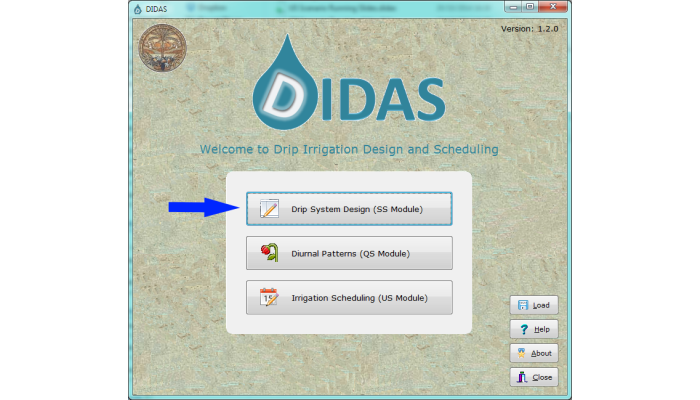 Irrigators of annual and perennial crops can use DIDAS as a decision-support tool for assistance in selecting optimal designs of drip-irrigation systems and optimal irrigation schedules, where water is a key limiting factor in crop production. The program can serve as both a benchmarking tool for assessing and comparing existing system designs and irrigation schedules and for developing new, water-use-efficient designs and schedules. "Design" does not refer to the hydraulics of the irrigation system (pumps, valves, filters, pipe diameters, and the like), but to the geometrical attributes of the drip-irrigation system. These include: distances between emitters along drip lines and between drip lines, the depth of subsurface emitters, and the size and depth of root systems. DIDAS assesses the effects of these attributes on the plant's water-use efficiency under various environmental conditions (soil properties and atmospheric evaporative demand). DIDAS only refers directly to drip irrigation. 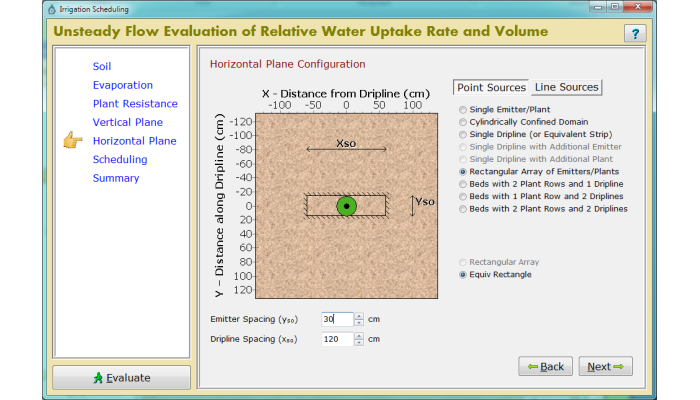 Nevertheless, its three modules can also assist in understanding and assessing furrow irrigation, for example, by simulating irrigation with parallel line sources on a flat soil surface. "Scheduling" refers to, and assists in optimizing drip-irrigation schedules for both 'every-few-days' irrigation and multiple daily irrigation pulses. DIDAS evaluates the effects of irrigation frequency, daily hours of water application and irrigation-pulse duration on water-use efficiency for a given scenario of: drip system design, soil properties, root system size and depth, and atmospheric evaporative demand. 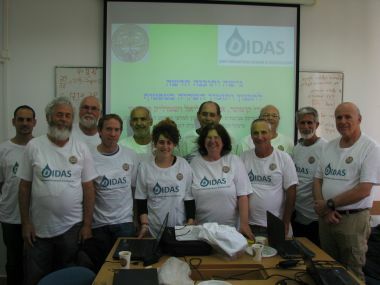 DIDAS cannot be used to assess plant water-use efficiency in rainfed crop production or when applying supplemental irrigation, i.e., it refers only to regular irrigation schedules. 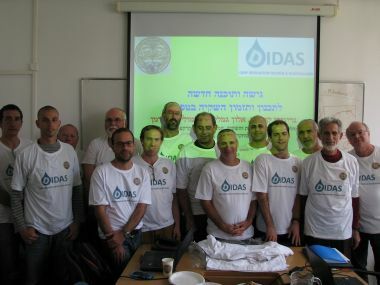 Researchers, lecturers and students can use DIDAS as a research or training tool for studying the effects of various boundary (engineering and environmental) conditions on the processes of 2D and 3D water flow and uptake in variably saturated soils. Setting scenarios of coupled, on-surface or subsurface water sources and subsurface sinks, and utilizing the graphical outputs of the spatial distributions and temporal patterns of soil water potential enable methodological studies of the roles of gravity and capillarity in driving the soil water, and of the effects of soil, plant and atmospheric evaporative demand on water flow and uptake by plant roots. DIDAS also allows setting scenarios with just point or line water sources, which are relevant to other agronomic and environmental practices and to processes involving water application and leaks with no water uptake by plant roots. What are DIDAS' concepts and principles? DIDAS is designed to be user-friendly and to use a minimal number of readily available and intuitive parameters, while at the same time maintaining accuracy, robustness and relevance. 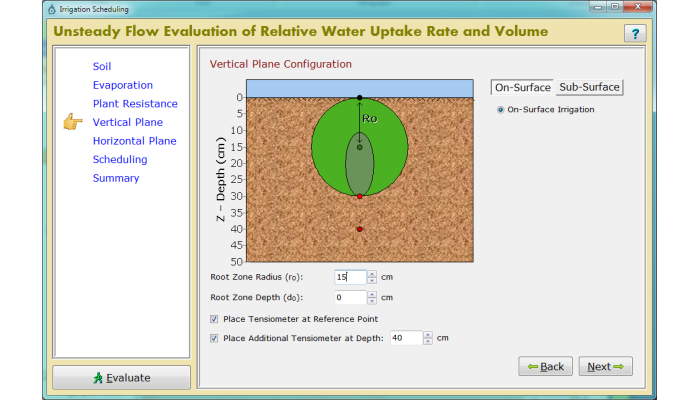 The program performs computations based on analytical solutions of the relevant linearized water flow and uptake problems. Water flow is described by the superposition of solutions for positive sources (on-surface or subsurface emitters) and negative sinks (plant root systems). Steady water flow is assumed in the design module and unsteady flow is used in the irrigation-scheduling module. 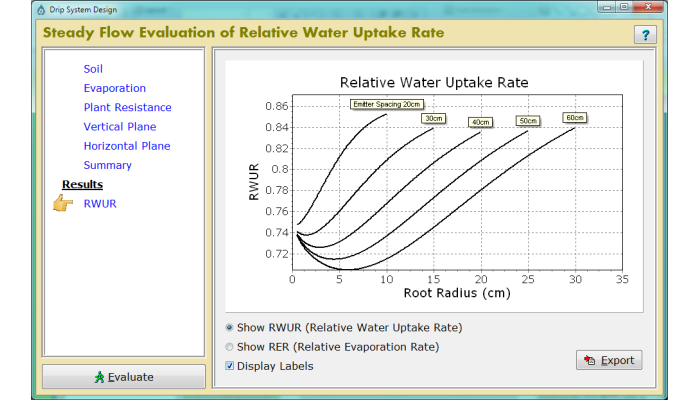 The design tool is based on a new, relative water-uptake rate (RWUR, ratio between water uptake rate and irrigation rate) criterion suggested for assessing the effect of the geometrical attributes on water use efficiency. The recommended RWUR criterion for design purposes is evaluated under the assumption of no plant-atmosphere resistance to water uptake. Namely, the plant roots apply maximum possible suction and the water uptake is determined only by the capability of the soil to conduct water from the sources (emitters) to the sinks (root zones). 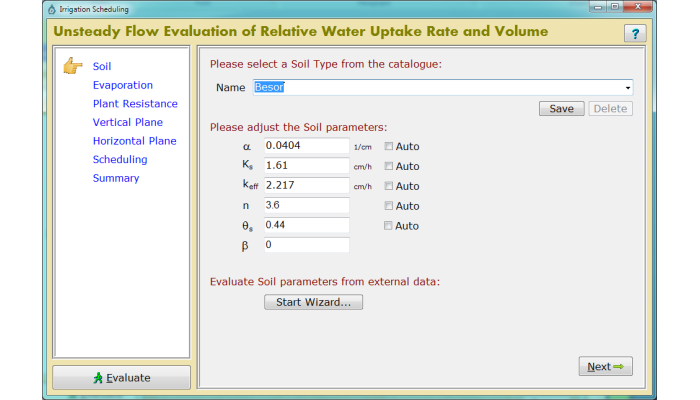 The computations of the RWUR require only three parameters describing soil texture, root-zone size, and potential evaporation in those few cases where it is important to account for evaporation from the soil surface. 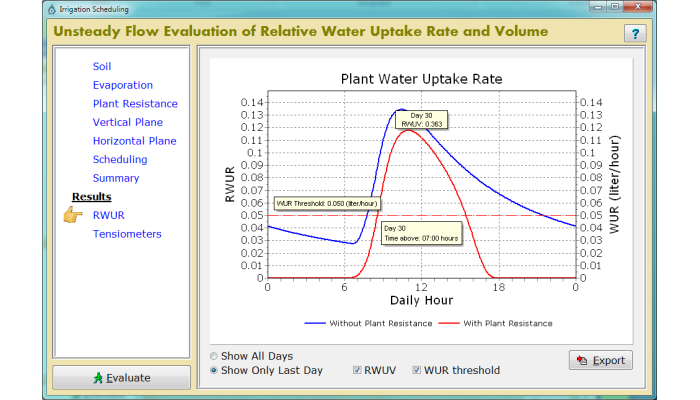 The irrigation-scheduling optimization tool is based on modeling unsteady water flow and on a relative water-uptake volume criterion (RWUV, ratio between daily water-uptake volume and daily irrigation volume). An alternative optimization criterion is maximization of the daily hours for which the evaluated (absolute) water-uptake rate is higher than a given threshold value. 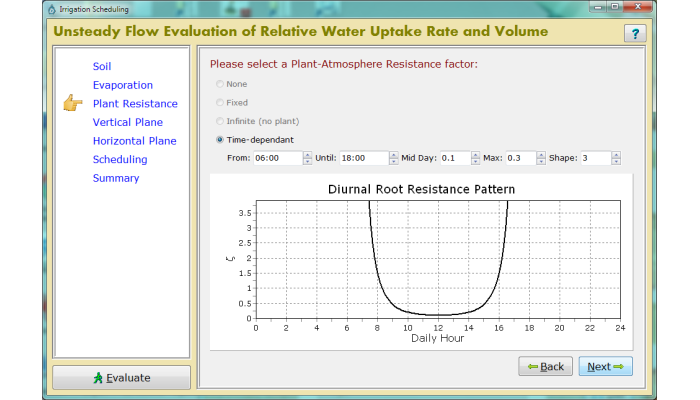 The computations of diurnal patterns of water-uptake rates and daily RWUV for a given irrigation scenario require additional information on the diurnal pattern of the plant-atmosphere resistance to water uptake and on the hydraulic conductivity of the soil. DIDAS is written in DELPHI and runs under Microsoft Windows operating system (version XP and higher) with no special supporting software requirements. The construction of the drip-irrigation scenario is performed via a few GUI windows, which also contain a library of the required input parameters, and a best-fitting procedure for the soil parameters. The computed RWURs and RWUVs are displayed graphically and the tabulated output results can be exported to e.g. Windows Excel for further processing. 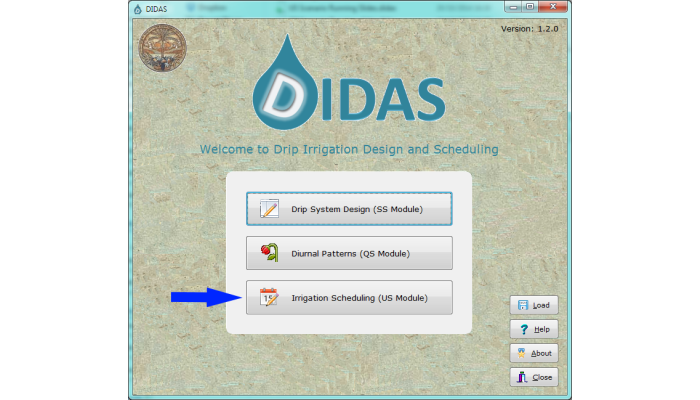 DIDAS also includes an on-line help feature that assists in setting up the irrigation scenario and choosing the desired output. An updated version of the DIDAS package can be downloaded freely below. DIDAS is comprised of three parallel, independently operating modules. Thus, the user can start running any one of them, and when moving to another module the relevant input parameters are saved for further use, if not altered by the user. The irrigation scenario is set up by filling in the input parameters of all relevant GUI windows, with possible back and forth, non-sequential navigation between the windows. 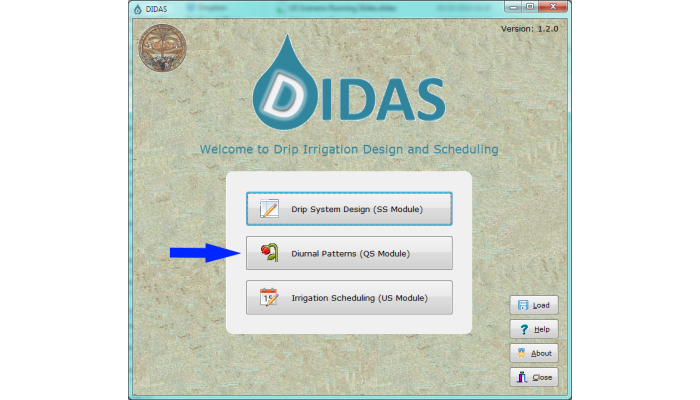 When downloading DIDAS for the first time, it contains a set of default parameters; when it is run again, it remembers the irrigation scenarios defined during that last use in each module. It is also possible to save in an external file a defined irrigation scenario for future use. 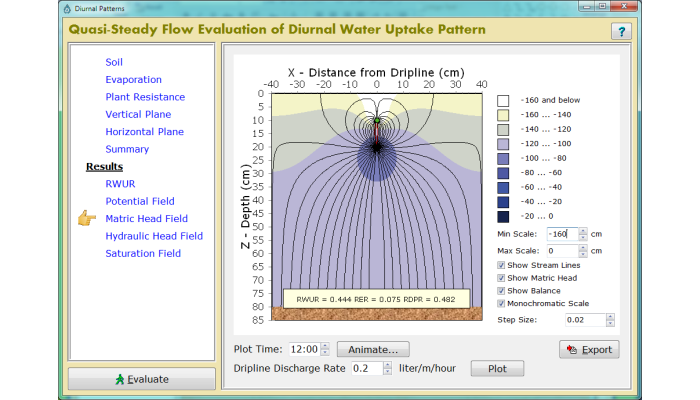 The design tool computes the RWUR, and its output is the RWUR as a function of the radius of the root zone for different emitter or drip-line spacings, depending on the chosen scenario. We recommend assigning zero plant-atmosphere resistance to water uptake when assessing drip-system design issues. 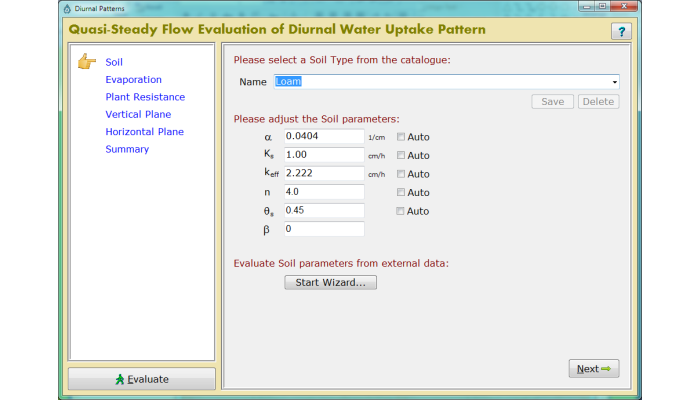 The diurnal pattern module, accounting for the daily patterns of the plant-atmosphere resistance to water uptake and evaporation, serves as a mediator of the other two modules for fine-tuning of the design and for preliminary evaluation of water-uptake patterns, especially in moderate to fine-textured soils. Its output is the diurnal pattern of RWUR, as well as the relative (to irrigation) evaporation (RER) and deep percolation (RDPR) rates. This module also depicts the flow fields (equipotential and stream lines) for various emitter/root-zone configurations. 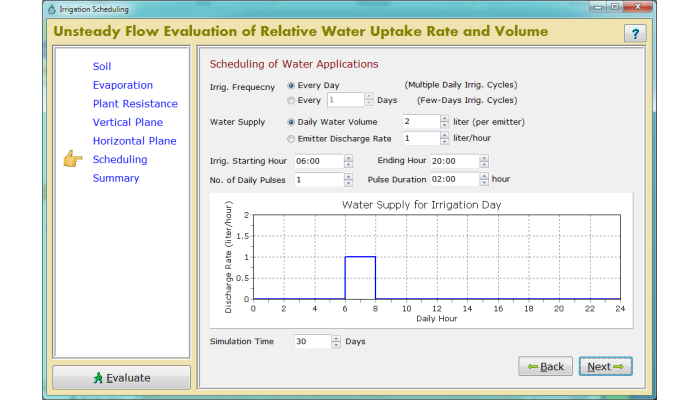 The irrigation-scheduling tool computes the diurnal (and every-few-days irrigation cycle) patterns of the RWUR and the daily and irrigation-cycle mean RWUV for a given irrigation scenario, accounting for the hourly plant-atmosphere resistance to water uptake. 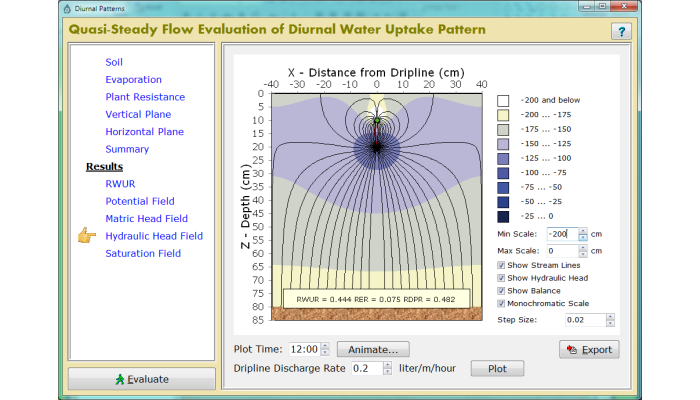 This module also depicts the temporal patterns of the water potential at specified locations. The simulated scenario of irrigation scheduling should include a sufficient number of irrigation cycles (larger for clayey as compared to sandy soils) to approach a quasi-steady, periodic pattern. Please provide the following information to help us keep the users statistics, and if you wish to be notified in the future on new, updated DIDAS versions, please provide also your name and E-mail address. By downloading DIDAS from this site, you agree to our terms and conditions. DIDAS requires Windows XP at minimum. Communar, G. and Friedman, S.P. (2010a). Relative water uptake rate as a criterion of trickle irrigation systems design: 1. Coupled source-sink steady water flow model. Soil Sci. Soc. Am. J., 74:1493-1508. Communar, G. and Friedman, S.P. (2010b). Relative water uptake rate as a criterion of trickle irrigation systems design: 2.Surface trickle irrigation. Soil Sci. Soc. Am. J., 74:1509-1517. Communar, G. and Friedman, S.P. (2010c). 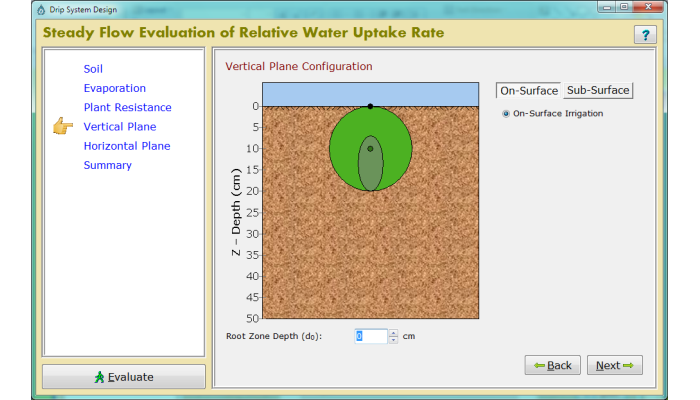 Relative water uptake rate as a criterion of trickle irrigation systems design: 3.Subsurface trickle irrigation. Soil Sci. Soc. Am. J., 74:1518-1525. Communar, G. and Friedman, S.P. (2010d). Steady infiltration from point sources and water uptake in confined cylindrical domains. Soil Sci. Soc. Am. J., 74:1861-1867. Communar, G. and Friedman, S.P. (2011). General solution for steady infiltration and water uptake in strip-shaped, rectangular and cylindrical domains. Soil Sci. Soc. Am. J., 75:2085-2094. Communar, G. and Friedman, S.P. (2012a). Generalized coupled source-sink model for evaluating transient water uptake in trickle irrigation: I. Model formulation for soils with vertical heterogeneity. Soil Sci. Soc. Am. J., 76:779-790. Communar, G. and Friedman, S.P. (2012b). Generalized coupled source-sink model for evaluating transient water uptake in trickle irrigation: II. Illustrative irrigation scheduling scenarios. Soil Sci. Soc. Am. J., 76:791-805. Communar, G. and Friedman, S.P. (2013). Unsteady infiltration from point and line sources in laterally confined domains. Soil Sci. Soc. Am. J., 77: 1529-1541. Communar, G. and Friedman, S.P. (2014). Determination of soil hydraulic parameters with cyclic irrigation tests. Vadose Zone J., doi: 10.2136/vzj2013.09.168. Friedman, S.P., Communar, G., and Gamliel, A. (2016). 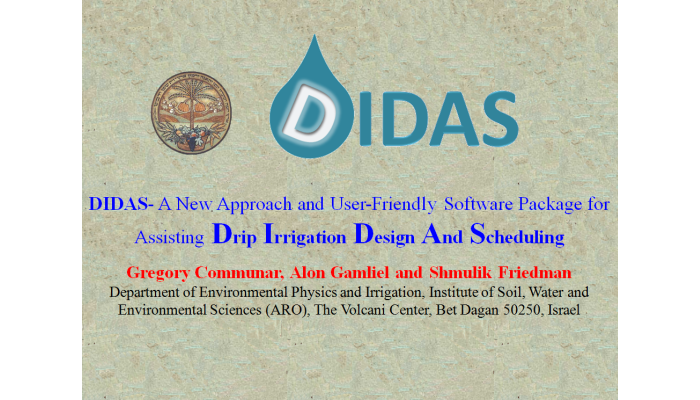 DIDAS - User-friendly software package for assisting drip irrigation design and scheduling. Comput. Elect. Agric., 120:36-52. Meiri, A. Naftaliev, B. Shmuel, D., Yechezkel, H. Communar, G. and Friedman, S.P. (2011). Short-term watering-distance and symmetry effects on root and shoot growth of bell pepper plantlets. Agricultural Water Management, 98:1557-1568. Gregory Communar is a researcher at the department of Environmental Physics and Irrigation of the Israeli Agricultural Research Organization. He studied hydrogeology in the department of Water Supply Systems, Hydraulics and Geology of the Polytechnical Institute in Tashkent and received a PhD degree in hydrogeology from the Moscow State Research Institute of Water Supply Systems, Hydromechanics and Hydrogeology (VODGEO) in USSR at 1974. Gregory's research interests include various hydrologic and irrigation issues (home page). Shmulik Friedman is a researcher (and was Head on 2005-2008) at the department of Environmental Physics and Irrigation of the Israeli Agricultural Research Organization. He studied soil science in the Agriculture Faculty of the Hebrew University of Jerusalem and received a PhD degree in agronomy at 1993. Shmulik's research interests include various soil physics and irrigation issues, and occasionally he teaches a course of Physics of Soil Water at the Hebrew University (home page). Alon Gamliel is a professional developer with expertise in Java and web technologies. He holds a B.Sc. degree in Computer Engineering from the Technion and a M.Sc. degree in Computer Science from the Tel-Aviv University. Alon's experience includes foundation of several start-ups and consultation services to various organizations (contact). 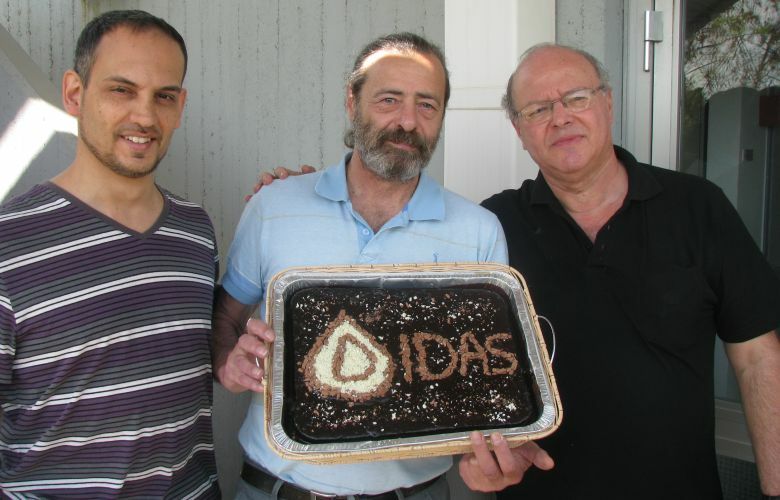 The development of DIDAS was supported by the Fund of the Chief Scientist of the Israeli Ministry of Agriculture and Rural Development, projects no. 301-0655, 301-0691 and 304-0488. We thank Limor Friedman for designing the DIDAS logo. Have a question about DIDAS? Drop us an email at didas@agri.gov.il, or send us message directly via the form below.